Suzanne has a Masters in Business Administration and a Bachelors of Science in Animal Science. She is a certified Nose work Instructor and Canine Good Citizen Evaluator. Suzanne worked in Corporate America until 2002 and then returned to her true love which is working with dogs and their owners. She has loved animals her whole life and has worked as a professional dog trainer since 2002. 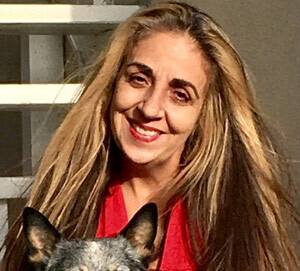 For many years Suzanne owned two doggie daycares providing daycare, boarding and training services where she oversaw 40-80 dogs daily in a cage-free environment. Suzanne’s passion and profession is to strengthen the animal – human bond through education and instruction using scientifically proven methods. Her dog training company – Canine Path specializes in working with all breeds of dogs and a wide variety of dog training and behavior problems, Additionally, she specializes in working with dogs exhibiting anxious, aggressive and more difficult behaviors and works with their owners to achieve a more harmonious relationship. Suzanne also works with a number of dog rescue groups and shelters to evaluate dogs with training and behavioral problems. Together they build and implement training and behavior modification solutions for their dogs to help them find forever, loving homes. Suzanne is dedicated to improving the lives of animals and people through education and personal commitment.